Posted on December 23, 2015 by Wuensch Construction Inc. This customer in Eden Prairie, Minnesota called Wuensch Construction out of Excelsior Minnesota because their existing Kitchen needed remodeling to bring it up to date. Their existing kitchen was dark and none functional and they want to brighten it up and use more of the existing space. Wuensch Construction came up with a design they loved! Take a look at the before and after pictures! Posted on October 28, 2014 by Wuensch Construction Inc. This customer on Lake Minnetonka in Excelsior, Minnesota call Wuensch Construction thinking they had to totally remodel their existing kitchen. After meeting with them we decided they only had to bring their kitchen and other details in their house up to date. We started with the existing flush panel hollow core doors in the hallway and installed solid core 6 panel oak doors. On the existing oak parqake flooring we covered with a dark vinyl wood grain flooring to contrast with the white cabinets. We put a fresh coat of paint on the existing cabinets and installed new Granite counter tops. We install new stainless under mount sink and touch faucet with new stainless steel appliances. !Take look at the before and after pictures! Another job Wuensch Construction exceeded the customers expectations. Posted on March 22, 2014 by Wuensch Construction Inc. This customer out of Chanhassen Minnesota called Wuensch Construction base out of Excelsior Minnesota because he had water leaking problem. He told Wuensch Construction that his upstairs master bathroom shower floor was leaking water onto his first floor family room ceiling. The customer was thinking of remodeling his existing bathroom shower to fix the water leak. 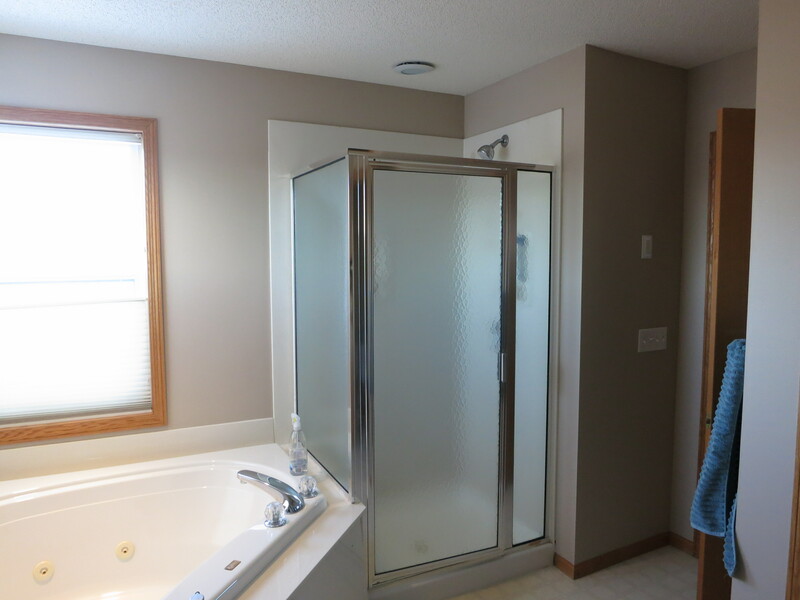 Wuensch Construction investigated the problem and found out that the leak was not from his shower floor or walls but from his shower enclosure. 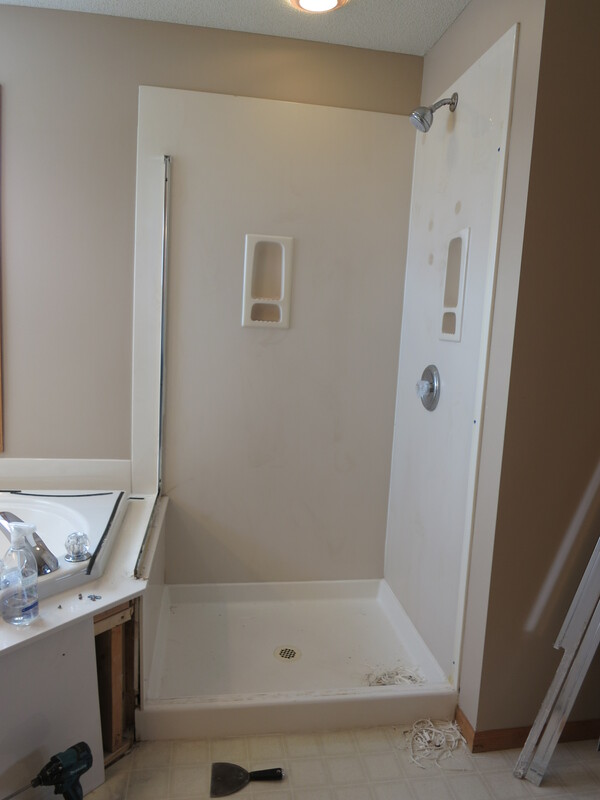 Wuensch Construction advise the customer all we had to do is to take apart the existing shower enclosure and clean up all the old existing caulking sealer. Wuensch Construction would then apply a new fresh coat of caulking sealer and that would resolve the problem. 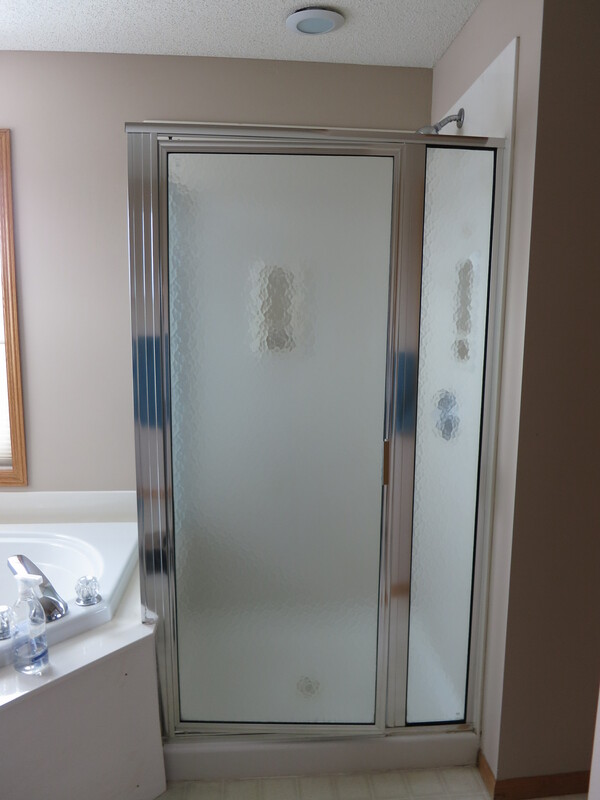 Guess what, it fixed the problem and the customer was very happy With Wuensch Construction that he did not have to spend all that money on a new remodel shower. Here are some pictures of the project in Chanhassen Minnesota. You don’t always have to spend a lot of money to fix a problem. Posted on March 9, 2014 by Wuensch Construction Inc.
Wuensch Construction likes to share some pictures from this weekend March 8th 2014 Southwest Metro Home, Landscape & Lifestyle Expo in Chanhassen, Minnesota. Posted on October 14, 2013 by Wuensch Construction Inc. Here are some more before and after Kitchen Remodeling pictures that was part of the hunt club remodel Wuensch Construction completed in the Twin Cities West Metro Area. Posted on October 3, 2013 by Wuensch Construction Inc. These customers in the Twin City West Metro Area called Wuensch Construction in Excelsior, Minnesota. This was a unique challenge for Wuensch Construction because a hundred or so members all owned this hunting club and wanted to remodel there existing club house to fit there needs for a new locker room with large lockers, benches, showers, bathroom and a dressing area. After receiving their dreams and wishes for this locker area Wuensch Construction jumped into action. After three or four different design options, Wuensch Construction came up with a Remodeling Design that they all loved (that was hard to do for hundreds of customers for one single remodeling project). Here is the before, during and after pictures with the floor plans. Another job by Wuensch Construction that met and exceeded all of these customers expectations. Posted on March 30, 2013 by Wuensch Construction Inc.
Fresh out of high school, Jeff Wuensch literally started building for the future, learning to be a carpenter journeyman specializing in custom home remodeling and new home building. As the owner of Wuensch Construction, Inc., 90 Brentwood Avenue in Excelsior, he has been keeping up with the latest trends in remodeling and home building ever since. A student of the trade, Wuensch has more than 30 years of experience in a wide variety of renovation projects from commercial build-out, bathroom and kitch­en remodeling, plus custom-built decks, porches, additions and homes. Ongoing dedication, education and work experience keeps Wuensch on the leading edge of the construction business. His recent designation of Certified Ag­ing in Place Specialist through the National Association of Home Builders ensures he is prepared to tackle the issues facing many baby boomers as they consider their existing living space and future independence. As a member of the Minnesota Home Builders Association and National Associa­tion of Remodelers Industry, Wuensch Con­struction stays on top of the latest code is­sues, attending continuing education classes every year. He also stays informed of the latest trends in remodeling and new homes through team designers and partners. The company is a Certified Lead Safe Firm, achieved through the Environmental Protection Agency. When work is done in homes pre-1978, the company makes sure every person living and working there is safe from lead poisoning. Wuensch started his work experience in the building industry in 1978 when he joined the carpenter’s union. Working dur­ing the day, he found time to attend night school at Minneapolis Technical College and became a Certified Carpenter Journeyman through the State of Minnesota. Over the years, Wuensch completed other construction and business related courses to help achieve a successful business. The company is involved with the local Excelsior community as a member of the Ex­celsior-Lake Minnetonka Chamber of Com­merce. Wuensch volunteers for local events and offers support to other small businesses in the community. Call for an in-house appointment at 952-322-0508. 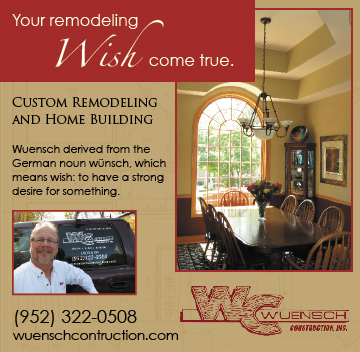 Wuensch Construction ran this ad in Chanhassen, Chaska, Excelsior, Shorewood, Eden Prairie.